Every good horseman will tell you that a racehorse does his best running when he's happy. The hard part, of course, is figuring out how to put him in that headspace; horses aren't always logical creatures. About a year ago now, trainer Clinton Stuart tried sending his hard-knocking gelding Wings Locked Up home to his ranch in Oklahoma for a vacation away from the racetrack. Sounds nice, doesn't it? With that lesson in mind, Stuart had a plan for Wings Locked Up's next “vacation.” The gelding bled a little bit in a September start at Remington Park, finishing seventh that day, so Stuart backed off his training. This time, however, he kept Wings Locked Up in his stall at the track, just walking him around the shed row and occasionally taking him out for some light exercise. Four months later, making his 7-year-old debut, Wings Locked Up shocked bettors at 21-1 in Sam Houston Race Park's Turf Sprint Stakes. 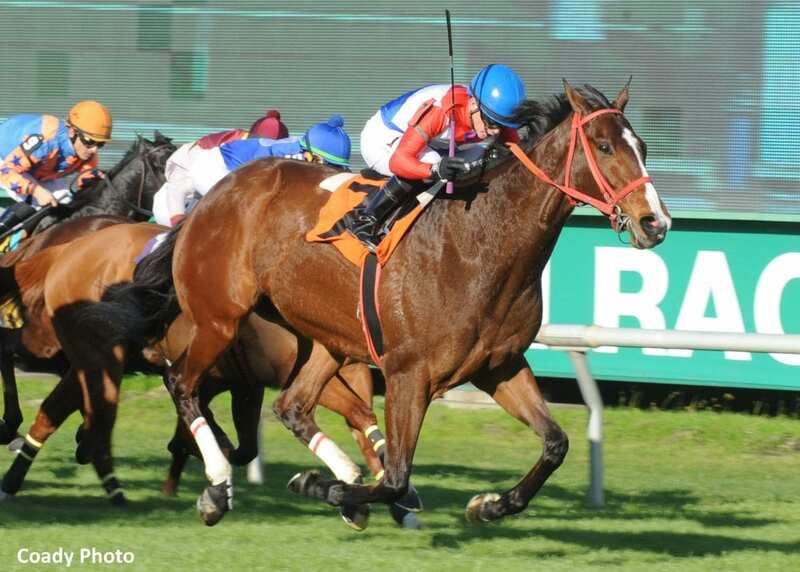 Racing on the undercard for last Sunday's Houston Ladies Classic, Wings Locked Up laid just off the pace and flew home to win the Turf Sprint by 1 ¼ lengths. His final time for the five-furlong test was 56.40 seconds, just shy of the track record (:56.21). The giant gelding, all of 17 hands tall, has now won 18 of his 51 lifetime starts to earn $609,907. It's an impressive resume for any horse; even more so for a horse that broke his maiden for a claiming price of $15,000 back in 2014. Stuart picked out Wings Locked Up in February of 2016 at the Fair Grounds, dropping a $25,000 claiming slip for the gelding. Unfortunately, the Oklahoma-foaled gelding isn't eligible for any state-bred bonuses because his breeder didn't have his dam's paperwork straightened out at the time of his birth. Still, Wings Locked Up, named for a duck-hunting phrase, has proven to be a solid investment for Stuart and his partners. The gelding is the first horse for “Sad Sac Racing,” comprised of Stuart's wife, two friends from Houston he met at a rodeo and another friend from Virginia. The group is very close; they have Super Bowl Sunday plans to head out to a local casino together. In his time with Stuart, Wings Locked Up has become a multiple stakes winner and earned $468,432. There wasn't any big change with his training, Stuart explained, just in the way they dealt with the gelding on the backside. Born into the Midwestern racing industry, Stuart has been training for 42 years and was once the youngest licensed trainer in Illinois. His record stands at 1,059 winners from 7,026 starts, with most of his recent numbers from tracks like Prairie Meadows, Remington, Canterbury, and Sam Houston. Wings Locked Up is the second-highest earner Stuart has ever trained, and while he's having a lot of fun with the 7-year-old gelding, his isn't under any illusions as to the horse's ability level. Stuart also mentioned how proud he was that Wings Locked Up had beaten 10-year-old millionaire Hogy in Sunday's Turf Sprint Stakes. This entry was posted in Connections, NL Article, People and tagged Breeders' Cup presents Connections, Chelsea Hackbarth, clinton stuart, Connections, Sam Houston Race Park, Texas Racing by Chelsea Hackbarth. Bookmark the permalink.